Imagine not having to spend time switching between suppliers to book a room, a flight, and local activities. Think about a trip-booking solution that allows for flexibly in changing your tour content. Consider a platform that can easily align your budget with the entire tour, including accommodation and activities. Well, such solutions have existed for a long time and they are powered by dynamic packaging systems. Unfortunately, only a fraction of travel industry players employ this approach. Several decades ago, packaged holidays were exclusively in the province of tour operators. Time passed and new technologies opened doors to the dynamic packaging world for online travel agencies (OTAs), travel suppliers, and vacation planning tools. The old-fashioned practices combined with emerging technologies have been transformed into an innovative tool, fueling travel industry disruption. Dynamic packaging technology allows shoppers to get customized tour packages comprised of various inventories including hotels, flights, car rentals, attractions, and events. The main difference between tours as they were and dynamic packages is that users can configure their trips via a single packaging interface and receive a full price estimate based on individual pricing and availability of each component in dynamically generated tours. Semi-dynamic packaging. The total price of the package changes based on selected components. The price of inventories remain static. This approach is common for systems with legacy revenue management modules. Prices are centralized and rarely changed. But when prices are changed, the changes are manual. Dynamic pricing. The price of the package is a sum of variable inventory prices. Price variability depends on factors that apply to each inventory. These factors can be a customer type, an inventory supplier, or other individual factor. Full dynamic packaging. In this case, yield management is applied to the whole package, based on value for the customer, combination of inventories, etc. For instance, if a user chooses more expensive flights, the price of a hotel can be increased respectively. While dynamic packaging is not new to the travel industry, the approach gained popularity due to the demand for the one-stop booking experience. Customer experience personalization also heats up interest for packaged tour solutions: Personalized packages potentially solve a plethora of problems related to the pre-booking research traditionally done by travelers. The typical system consists of three main layers: supplier integrations, a business logic layer, and a user-facing layer. 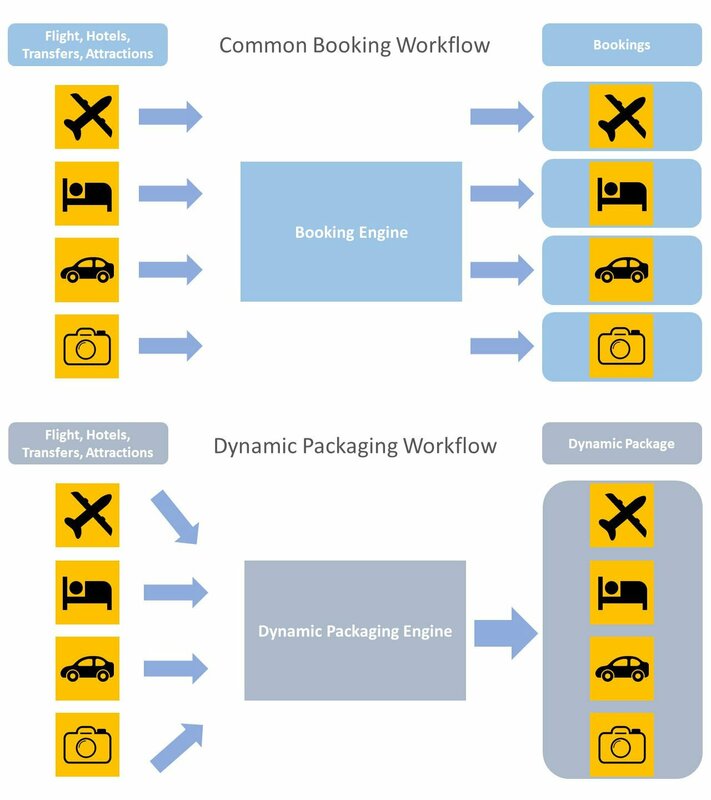 Tour operators and OTAs are potentially the main users of dynamic packaging. Currently, most tour operators quote a total tour price while OTAs break down the pricing by components. Dynamic pricing automates the service that defines the core value for both types of businesses: providing a holistic booking experience. Tour operators automate their existing processes, while OTAs can introduce packages with all inventories properly time related to each other and aligned to user preferences. Dynamic packaging can also be used by hotels and airlines. By adding the ability to book services from external suppliers, such as car rentals or attractions, hotels and airlines can increase their direct bookings and complete travel shopping in one place. The customer doesn’t have to switch between providers. For example, Delta Vacations and Air Canada Vacations have already enhanced their booking capacities with hotels and car rentals. Although dynamic packaging is aimed at cutting costs for tour operators and increasing conversions for OTAs, it has one important disadvantage. The distribution of travel packages requires businesses to reconsider their customer support efforts and make additional investments in them. Supplier integration is a foundation layer of any packaging engine. It defines the inventory available for booking. The selection of suppliers depends on various factors, including target markets (different suppliers provide access to inventories in different destinations), inventory availability, API support, etc. Global Distribution Systems (GDS). GDS is a network system providing travel retailers with information covering airlines, hotels, and ground transfers. They return basic data including availability rates, and also allow for booking. Currently, GDSs cover a significant share of the market. Mostly they are represented by such companies as Amadeus, Sabre, and Travelport. A retailer that plans to integrate their service with GDS must meet a number of requirements. Central Reservation Systems and Computer Reservation Systems (CRS) of hotels and airlines. These systems consolidate the information about inventories on the supplier side. An OTA or tour operator can source inventories directly from a supplier. The main drawbacks of this approach are 1) legacy systems, 2) the absence of their own APIs, and 3) the need to connect with many suppliers to achieve decent coverage. Wholesalers and bed banks. These providers mostly cover the accommodation sphere. Wholesalers and bed banks suggest detailed information on travel inventories and provide modern API support. While they consolidate fewer suppliers than GDSs, the integration doesn’t require additional certification. Hotelbeds, Bonotel, and Cloudbeds are the main representatives in the category. 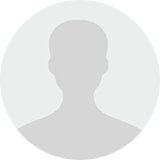 The systems here are usually more innovative than those of GDSs and suppliers. Events and attraction providers. This category includes tour and activity OTAs, local providers, and B2B wholesalers that supply information and booking capacities for museums, attractions, and events. Car rental suppliers. Besides integrating directly with local car rental services, a smart move is to consider the main players like CarTrawler and Rentalcars. They offer both information and booking capacities via their APIs. To get a broader understanding of integration opportunities, consult our overview of the main travel industry APIs. We listed all key service providers and detailed their engagement approaches. 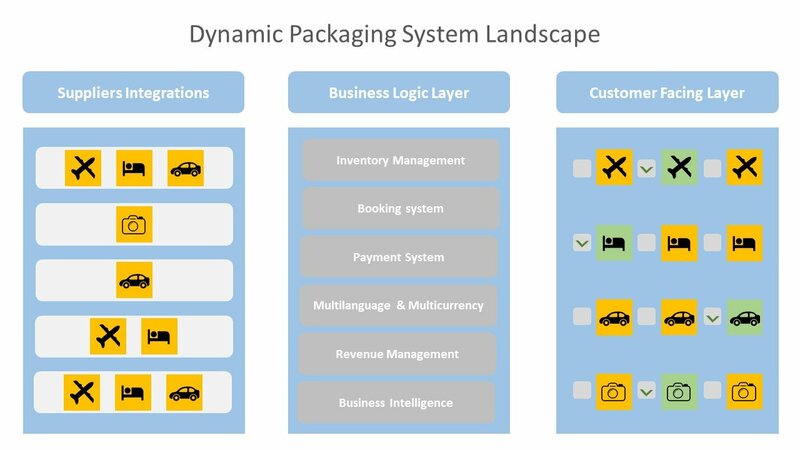 To enable dynamic packaging, all these components have to be cross-integrated with efficient data flow between them. So, the key barriers to integrating dynamic packaging in existing booking systems is the lack of consistency in the data collected and the slow exchange of information. When working with legacy systems, staff needs to switch between various software environments, using separate software for booking, payments, content management, and workflow. It makes operations time-consuming and potentially inaccurate. The other side of the problem is incompleteness and delays in data transition. Outdated prices and all lack of information about travel content frustrate customers and travel agents alike. Additionally, dynamic packaging should employ value-added functions like AI-based recommendation engines and revenue management systems. Modular design. You can break down the package into logical parts (e.g. Hotel> Flight >Transfer) and use an existing interface flow for each of these steps. Price and schedule visibility. Always list multiple flight, ground transportation, and accommodation options per step and ensure that travelers can see exactly how their choices impact the final price. Always quote upsale price adjustments, if an opaque price doesn’t apply. Explicit data collection. 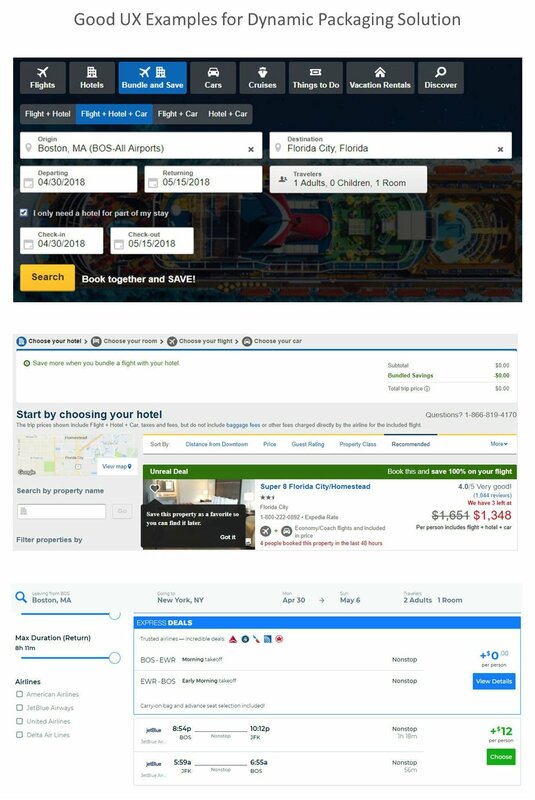 Regardless of whether you have a personalization engine under the hood or not, it’s always a good practice to ask users directly about their trip specifics to better accommodate their requirements. Introduce such fields as “business traveler,” “need a hotel for part of my stay,” “driver’s age,” and “flexible dates” to improve the search and simplify booking. Tours and activities based on other user choices. You can use a simple rule-based recommendation engine to suggest relevant attractions to be added to the package using the location, time, and accommodation data. Suggesting T&A is a good upsale opportunity. Chatbots for customer care. While chatbots can’t handle all customer problems, they can aid in the booking process, especially for older users. A recommendation engine becomes a critical aspect of any eСommerce solution. As the goal of dynamic packaging is to create a personalized end-to-end travel solution, the integration of a recommender engine can turn the system into a full-blown vacation planning platform. 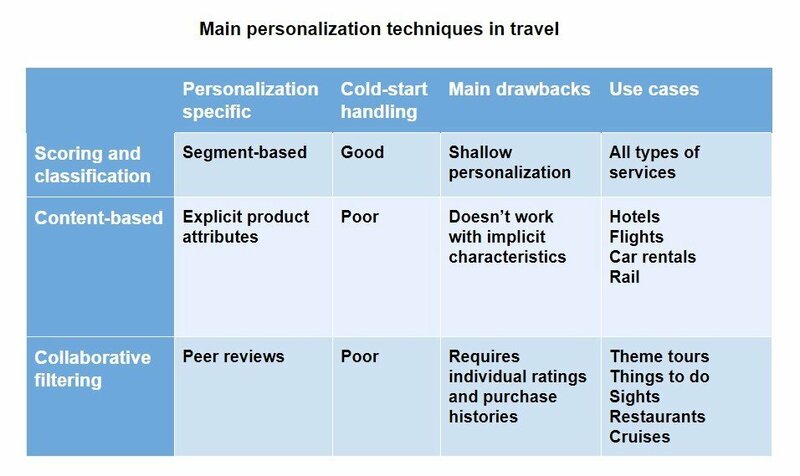 There are three basic personalization engine types that can be used in the travel industry. Scoring and classification. This technique entails dividing users into broad segments by type of travel, location, budget, and destinations. It provides a basic level of personalization that can be efficient in any type of packaging solution. Collaborative filtering. A less widespread technique is collaborative filtering, which suggests tailored travel products based on options picked by other users with similar characteristics. This method is more advanced and can be applied to those tours where explicit attributes like price, amenities, etc., don’t provide the full picture. These can be theme tours and specific attractions where the quality of a product is defined by the emotional experience of a traveler. The main problem that most personalization engines face is the cold start issue. It simply means that if the system doesn’t know a user well, it will need some time to gather relevant data to provide meaningful personalized suggestions. Scoring and classification methods partly bypass this issue as they can work with initial traveler data. The other two will require more time and user action tracking to work properly. The revenue management module makes a dynamic packaging engine more competitive. The technique entails achieving optimal sales by using customer segmentation, supply and demand insights, yield, and pricing data. A machine-learning-based system is especially valuable for online distribution. Smart algorithms allow for providing personalized offers to each client. The other benefits of the innovative approach are system autonomy, real-time data processing, and accuracy. The system can analyze behavioral, social media, and market data, assuming the right prices for the right people at the right place. Research and evaluation. Define the business need. Determine why you need dynamic packaging, what goals the company plans to achieve with integration. Prepare and document requirements for the system. Determine the ROI of the project. Select inventory suppliers. The match will depend on the scale, types of inventory the business requires, destinations, etc. You’ll have to decide whether to go with GDSs, inventory wholesalers, join the affiliate program of some large OTA, source directly from suppliers, or a combination of sources. Engineering. Select one of the alternatives: in-house development, engagement with a travel technology consultant, and the integration of an existing software product. If you plan to build an innovative solution with an AI-based recommendation engine and advance yield management functionality, we recommend considering consultancy involvement first. Reshape business processes. The new system allows a travel organization to optimize performance and boost efficiency. Assess the areas affected by integration and the changes that are required for training staff or recruitment of new specialists. Evaluate the project results. The results of implementation must be evaluated both by financial changes and customer feedback. Based on this information, further improvements can be added to the development pipeline. Dynamic packaging is the path to a one-stop travel customer experience, the trend that keeps developing and growing. Single-segment OTAs can use dynamic packaging as a lever to enter new markets. This fact makes dynamic packaging a good startup opportunity. Tour operators, on the other hand, can make customer experience more flexible by configuring packaged tours based on precise understanding of customer preferences. The technique can be also relevant for hotels and airlines. End-suppliers strive to increase direct bookings, but the main barrier is the customer need to combine accommodation, flights, and car rentals to complete a vacation purchase. Dynamic packaging can help introduce end-to-end booking coverage right from the supplier’s platform. Otherwise, travelers have to rely on OTAs suggesting solutions to customers for all vacation-related problems in one place.